With the weather transforming the Dallas-Fort Worth area from freezing temperatures into a warm, comfortable environment, many are starting to think about spring landscaping projects. The grass is starting to grow again, and all plants are beginning to blossom. 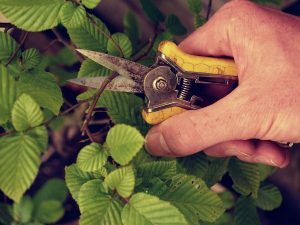 The current weather conditions are perfect for venturing outside and preparing your front and back yards, which means trimming the not-so-attractive branches off the trees. Our Fort Worth TX landscapers at Blooms Landcare specialize in tree trimming and pruning for residential and commercial properties, and we will make sure your home or business will be satisfied with our services just in time for the spring. Many ask why trimming or pruning is so important. A well-groomed tree, particularly during this time of year, will assist in the tree staying as healthy as possible. A well-manicured tree also prevents potential hazards. Some trees grow too large to where they are close to dangerous power lines. In addition, a pruned tree also helps a property from an aesthetic standpoint. Our Fort Worth tree trimming services include removal of damaged branches and stump grinding, in addition to other pruning services. Our landscapers also specialize in trimming hedges, offering full-service maintenance for your home or office. Feel free to contact our Fort Worth TX landscaping company today. Give us a call, or visit us online for details.